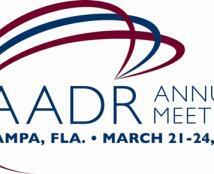 Tampa will welcome the International Association of Dental Research (IADR) this week for the 2012 AADR/CADR Annual Meeting & Exhibition, taking place at the Tampa Convention Center from March 21-24. The American Association for Dental Research (AADR) and Canadian Association for Dental Research (CADR) are both divisions of the IADR. The event will mark the 41st Annual Meeting & Exhibition of the AADR and the 36th Annual Meeting of the CADR. Approximately 3,000 delegates will gather in downtown Tampa for the annual event, producing over 6,000 hotel room nights in Tampa Bay. This year’s event will provide educational programming, networking sessions, awards ceremonies and receptions, hands-on workshops, panel discussions, mentoring sessions and much more. The AADR is a non-profit organization with more than 3,900 members whose mission is to advance research and increase knowledge for the improvement of oral health, support and represent the oral health research community, and facilitate the communication and application of research findings. Please join us in welcoming this group, and until the next time ... THINK TAMPA and stay tuned in for more meetings and conventions updates! The focus of the Convention Sales team of Tampa Bay & Company is to bring conventions and Tampa Bay meetings to Tampa Bay to create positive economic impact for Hillsborough County.